Lime Springs Beef located in Lime Springs, IA built a new slaughterhouse facility that processes up to 44,000 GPD (or 30 GPM), it also had high Total Suspended Solids (TSS). The slaughterhouse could not discharge their wastewater to the municipal supply due to very high levels of biological oxygen demand (BOD). 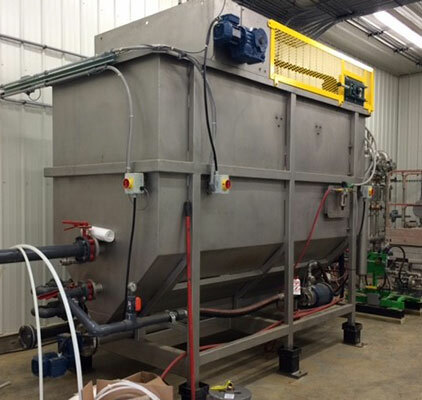 Discharging the wastewater from a slaughterhosue untreated would cause high organic loading to a municpal wastewater treatment plant and cause a variety of problems. 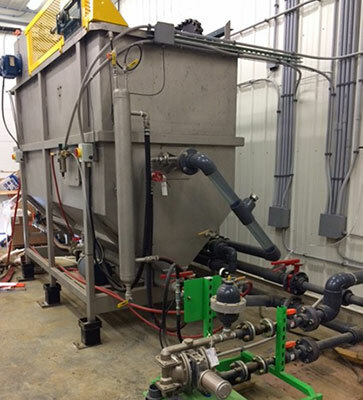 Our VLT-410 DAF was installed at the location and is properly treating their wastewater to lower the TSS and BOD levels. The DAF system included a Polymer Makedown System, a Chemical Feed System, a Sludge Pump Skid and a PLC Control System to operate all of the related DAF equipment. Please Contact Us Today! to discuss your needs for your slaughterhouse. As we design and build all our systems in house we feel very confident of providing you the most cost effective and superior treatment system on the market today. We have special expertise with all food related industries as well as most industrial wastewater problems.